I wish I had decent things to write tonight, but frankly, I am fatigued from hours of painting, giving a private lesson, and visiting with patrons during this evening. I need to retire to bed, and hope that I will have it within me to blog tomorrow. Good night, and thanks always for reading. How to resist the tendency for comfort when you have endured such discomforts opening the door of becoming? This indeed is the phase that separates out the ones who go forward from those who stay close to home. Working in watercolor throughout this day has been pleasurable, as always, though I am not getting what I want out of this particular painting. My preference in watercolor is some kind of balance between the loose spontaneity and the tight precision. Last night I began work on this diesel locomotive, drawing it out carefully in its details, and then working tightly on it until I closed the gallery around 10:30 p.m. Once I returned to it today, I continued the tight, detailed work, and suddenly backing away from it saw a piece that was too uptight and precise. I don’t like that. And now I am afraid to resort to splattering, smudging, dripping and all the reckless things I like to do. So . . . I guess I need to lay it aside until I decide what to do next. I could always start another watercolor or drawing or read a book or take a walk. At any rate, I’m going to stop with this one for a season. The imagination must learn to ply her craft by judgment studied. That’s it. For me, the success of a watercolor is that combination of powerful feelings and disciplined study. I’ll keep seeking that balance. When I use the term artwork or art project or enterprise, I mean not only the single piece in hand but also the entire collection of pieces that severally explore the issue under investigation. Any one painting may be a view of Mont St. Victoire or a view of a cathedral in Rouen, or a self-portrait, but the project intends an exhaustive study of the subject over time and circumstance, each piece another probe via another angle of inquiry. The afternoon and evening have proved delicious for painting and exploring the subject of trains as I’ve been privileged to ensconce myself in The Gallery at Redlands in Palestine, Texas. The Historic Inn at Redlands, where this gallery is housed, has turned into a most friendly neighborhood, as I have come to love the owners as well as the business personnel working here. Restaurant patrons drop in throughout the night, so I never feel alone, and I’m feeling good as this collection of train watercolors continues to gain momentum. I just started on this diesel this afternoon, and feel that I may possibly finish it while staying here over the weekend. The weekend has finally arrived, and I’m delighted to open The Gallery at Redlands in Palestine, Texas Friday and Saturday until 10 p.m., and Sunday till 5:00. I’m enthusiastic about starting a new train painting today, as I managed to complete #30 last evening. Thanks for reading, and I hope to have more news soon . . .
You come to the place of your art from the swiftly flowing river of work and domesticity in which from choice and necessity you have swum and bobbed along with everyone else. You emerge from this wide and deep stream, towel off, slip into something more comfortable, and step into your atelier ready to do a new kind of business. Waking early to a dark and rainy morning, I immediately recalled something I read yesterday from Peter London, found it, and post it now for you. What an inspiring word! Teaching every other day now gives me the richness of having these long days without appointment, and a studio ready to use. I am a YouTube junkie, and that wonderful resource plays nonstop on my large flat screen to give me the environment of my choice every day when I work/play in my studio. Of course this morning, I dial up one of those many delicious jazz-for-a-rainy-day stations. I can almost hear the chug of steam locomotives in the background, reminding me it is time to get back to the watercolors. Thanks for reading, and I hope you have the luxury today of emerging from the stream, totally refreshed and ready to pursue your personal enterprise. Before retiring to bed, I wanted to post the progress on this historic T&P #610 which is the property of the Texas State Railroad headquartered in Palestine, Texas. They towed this enormous steam locomotive out of its shed last weekend so photographers could photograph it. I began it as a plein air watercolor sketch, but the heat and humidity kept the paper too moist to work in satisfactory fashion, so I brought it inside and continued working from reference photos I took. It is as if our own body, the container that our very own being has been poured into, shrugs off its torpor and awakens to its possibilities to speak and take flight. In my reading early this morning, I came across this line from Peter London that captured what I felt yesterday, and the effects linger still today. I’m finished with my morning college classes and am returning to the studio with sustained enthusiasm. As artists, we know that we cannot make the wind of inspiration blow, but at least we can trim our sails to catch the breezes once they do stir. Yesterday morning I found myself with a full day available to make art, and am glad I went to work at it. A short time after beginning, I felt the surge. Waking early this morning, I enjoyed some quality reading and journaling, then went to class, inspired by the line I’ve posted above. I’m setting aside the Durango-Silverton posted above, because I feel that I’ve done enough to it to consider it finished. I’m still puzzling over the painting below, so I’m going to let it ride a bit longer. I have two more works in progress that need my attention, so I’ll see what I can accomplish with them. The creative geniuses of art and science work obsessively. They do not lounge under apple trees waiting for fruit to fall or lightning to strike. “When inspiration does not come to me,” Freud once said, “I go halfway to meet it.” Bach wrote a cantata every week, even when he was sick or exhausted. Though most composers would kill to have written even one of his best pieces, some were little more than wallpaper music. Eliot’s numerous drafts of “The Waste Land” constitute what one scholar called “a jumble of good and bad passages [that he turned] into a poem.” In a study of 2,036 scientists throughout history, Simonton found that the most respected produced not only more great works, but also more “bad” ones. They produced. Period. Good morning, blog readers. I regret that I have been away so long, but I just emerged from a punishing two-week schedule of engagements and only this morning woke to a dawn with no appointments till tonight. I’m happy in the studio once again, and decided to take a break to write you . . . 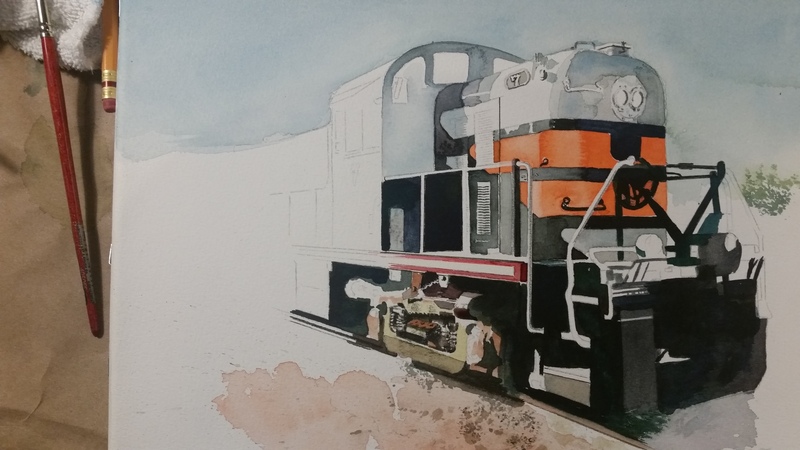 The past several weekends have been spent in The Gallery at Redlands in Palestine, Texas, where I have begun four new watercolors of trains: the Texas State Railroad #30 (above) along with the Durango-Silverton, Cumbres & Toltec, and the historic T & P #610, now housed in Palestine. I have been working since last March on a train show I plan to open in the gallery during this upcoming holiday season. The show will feature a number of framed original watercolors of historic trains, along with limited edition prints, greeting cards and postcards. We’re really hoping to increase the traffic through our new gallery that opened last March. I posted the quote above from a magazine article I tore out of Newsweek in 1993 and have shared with students every year since that day till I retired. I have to return to it to remind myself that I’ll never produce quality art until I am willing to make a large quantity of work and not fear the “bad” works that emerge. From my current four watercolors in progress, the one above is coming along as I like it. The other four, well, I’m not too pleased with what I see so far, but the one above didn’t start out so great either. I’ll just keep chipping away and grinding at the process. I do indeed love the work, and today has been sublime, and I’m not even close to the noon hour yet. One week ago, I had the daunting task of demonstrating my watercolor techniques before the Society of Watercolor Artists who meet in Fort Worth, Texas. I was invited nearly a year ago to do this, and had the entire year to worry over the details. As the day drew nearer, I felt sicker. This is an assembly of outstanding watercolorists, and I constantly second-guessed my worthiness to stand before them. Once the night was over, I could breathe again. The members of the Society were generous and affirming beyond description, but I’m just so happy to have that one behind me. I love watching other watercolorists share their craft, but just cringe when it’s my turn to stand and deliver. Thank you, SWA; I am sincerely grateful for your kind words and encouragement that night. I always linger a moment outside the Gallery before leaving to return home–I absolutely love working here, and remain so grateful to all those who made this available to me. There, seated on a bench, I started to jot down in my notebook some reflections similar to those that I am tracing here. . . . I cannot and must not live in any other way than through the mind; the food that it demands is more necessary to my life than that which my body calls for. Finally, a genuine “off” day between college lecturing. After the third week of the semester, I finally have my ducks in a row so that on the days I don’t have class I can actually spend my hours doing what I feel is most central to my life–reading, writing in my journal, blogging and making art. Tomorrow’s college lecture is ready so I don’t have to fret over those details. I rose at 5 a.m., with a sense of joy and anticipation. Following breakfast, I found myself in the watercolor studio picking at a composition I had been working on the night before. I now have three railroad watercolors in progress, and am happily moving to and fro among them. By 6:15, I decided to break from the painting and retreat to my study to continue my reading from Delacroix’s journals. I laughed out loud when I read the passage posted above, because I have felt foolish keeping a handwritten journal religiously since 1985, and still scribbling in it almost daily, then occasionally writing a blog from what I’ve already written in my journal. And here, I find Delacroix admitting the same thing–keeping a notebook, then re-writing, editing what he first wrote as he transfers it into the journal now published. From time to time, I wonder if I should print out all my blog pages, then wonder if that is really necessary, since I’ve already recorded most of this stuff in my handwritten journals. I have always loved this notion of “the life of the mind” and am gratified this morning to read Delacroix expressing the same sentiment. I’ve always feared that it sounded arrogant to say that I live a life of the mind, perhaps even foolish and impractical. But it’s accurate. Forty years ago this fall, I embarked on the life of the mind when I entered graduate school, thrilled at the daily pursuit of the history of ideas, and over these decades, reading has been my food, and attempting to express my ideas by making art and standing to deliver in classrooms has been my exercise. On Monday evening, I will stand before the Society of Watercolor Artists in Fort Worth for the purpose of doing a watercolor demonstration. To describe this event as daunting is a gross understatement. I’ve known of the assignment for a number of months, but still, the anxiety of standing and delivering amidst a body of seasoned watercolorists keeps my inner doubts churning. At any rate, I’m preparing daily now to have something (hopefully) worthy to say and demonstrate when that hour arrives. Wish me luck! Much of what I express on these blog pages is being shaped into the coming presentation. So, again, I thank all of you for your reading and your responses. Until next time then . . .